The mechanical harvesting of grapes. 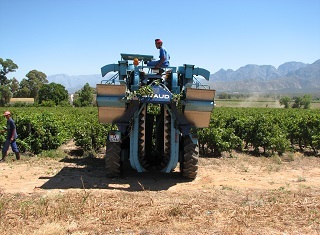 Increasing labour costs and labour problems have been major causes of vineyard mechanisation. 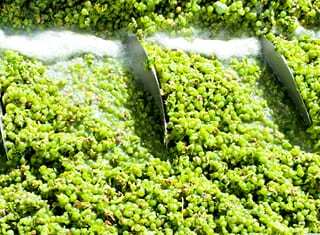 It can however create other advantages and disadvantages and cellars must be prepared to receive such grapes and utilise it optimally. Manual labour will most probably be used less going forward and it is essential that cellars prepare themselves for this. An experiment was executed at Chateau Ste. Michelle cellar, Washington, USA, to compare Cabernet Sauvignon wines that were made from a vineyard which was mechanised or hand-treated or a combination of both. A Cabernet Sauvignon block was divided in six sections. Half of it was fully mechanised, which includes pruning, shoot thinning, leaf removal and mechanical harvesting. Pellenc equipment was used for these treatments. The other half of the block was hand-pruned and thinned, but mechanically harvested. 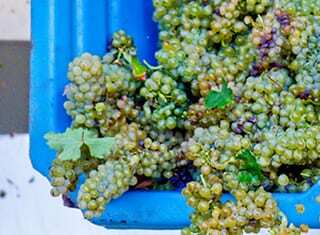 Two of the hand-treated sections and two of the mechanised sections respectively were fermented together and the other sections hand-treated and mechanised grapes were combined and fermented together. Grapes were harvested on the same day, the same yeast strain and yeast protocol were used, before it was matured in barrels. The same malolactic culture was also used for the three different lots and sulphur dioxide was added in all cases after completion of the malolactic fermentation (MLF). The mechanised practices were cost-saving, mainly because they could have been applied within 24 hours and some of the equipment could have been adjusted for specific aims. The different treatments led to differences in the initial sugar, total acid and nitrogen concentrations of the different fermentations. 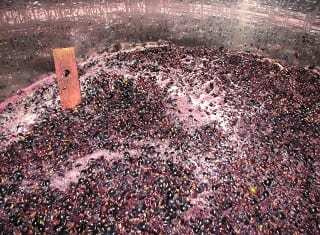 As expected the mechanised vineyard resulted in slightly more tannins, anthocyanins and pirazines, which can however be decreased by less extraction during skin maceration. The resulting wines exhibited the same style and analytical characteristics and although taste differences occurred, the preference was subjective. The wines from the different treatments did still comply with their market requirements and were on the higher level of their quality requirements. Uncertainty exists however about the influence of mechanisation on the long-term condition of the vineyard. The present viewpoint is that mechanisation as result of its nature requires more cleaning up than manual labour and the latter can consequently not be eliminated completely. Depending on the individuals performing it, manual labour can also have different results. Experiments need to be executed in the long-term to verify the impacts of mechanisation). The basic difference between hand-picking and mechanical harvesting is the separation of the berries. With mechanical harvesting it takes places in the vineyard, which leads to the early potential breaking of the berry and more juice in the loads. The first impact is on the price of the grapes seeing that only berries and not bunches are bought. The absence of the stalks will influence the tannin concentration of the juice, the drainage of the juice and the pressing of the skins. The higher percentage juice and broken berries will favour the oxidation of the juice and the necessary precautions should be applied, if necessary, by transporting loads under tarpaulins with an inert gas atmosphere and/or the addition of anti-oxidative additives like sulphur dioxide and ascorbic acid. Lasky, M.S., 2017. How do mechanized vineyards compare to hand-treated? Wine Business Monthly, October 2017: 36 – 39.